My GBS story started on October 5, 2009. I woke up to find my almost 2 month old barely able to breathe. We rushed him to Children's Hospital in Omaha and upon arrival he had stoped breathing altogether. They rushed him back and put a breathing mask on him to get him ready for a breathing tube to be put it. At first they had no idea what would have caused this, so they pumped him full of fluids and meds while they took blood and even did a spinal tap to try and get answers. Once they got him stable and up to the PICU the results came back -- Group B strep. 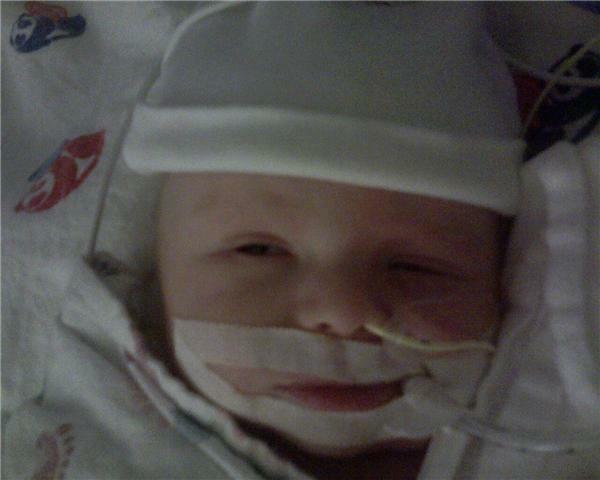 He was on a ventilator for 1 week in the PICU while getting so many different types of meds I lost count. He didn't even look like my little boy with all the fluids in him. It was the scariest thing I have ever gone through. He fought his way back and was released after another week on the recovery floor. Now he is happy and healthy, but we will never forget what he went through and thank God that we still have him with us. I wish people knew that GBS isn't just passed on to the baby at birth. They can get late-onset GBS as well. We took a parenting class when I was pregnant and we hardly discussed this illness. I just wish more information was out there about it so parents can be aware that it is a very deadly thing that a baby can catch later on in life, too.